When Trevor May is pitching in relief, he ditches his slider and sinker. That mindset is exactly why the Twins need May in that role, even if it means delaying the starting opportunity that he has certainly earned. In 2015, the Twins bullpen ranked last in the major leagues in strikeouts, right behind Detroit’s abysmal unit. Missing bats isn’t everything, but doing so effectively eliminates bad luck, bloopers and bleeders from the equation, which can be particularly critical in close late-game situations. General manager Terry Ryan is quick to point out that his team's last-place ranking is “a little deceiving” since they received only partial seasons from May and Kevin Jepsen, and Glen Perkins was not himself after the All-Star break. It’s a fair point. Even with little in the way of outside additions during the offseason, you’d expect more strikeouts – and better results – from the relief corps even if the Twins simply roll with the same group that finished last year, as it appears they basically will. But there’s no guarantee that Perkins will fully rebound from his dismal second half, nor that Jepsen will replicate his uncharacteristically excellent performance after being acquired. It is in this regard that May’s presence is vital. His stuff was good enough to yield quality strikeout numbers as a starter and plays up in relief, which consequentially led to an uptick in K-rate after he made the switch last summer. That was when he was learning on the fly. Now, the right-hander heads into the 2016 season priming himself as a reliever. That entails a lot of different things compared to starting. In some ways, less is more. If he sticks in a relief role, May will pitch way fewer innings, but he’ll affect way more games, and he’ll be deployed in more high-leverage situations. He relishes the idea of being a designated go-to guy in those spots. "I see it as an opportunity to step into a role that wasn’t filled in the offseason,” he said. "I’m excited about it. I think I proved last year that I could do it. I’m looking to build on that success this year." Fans should be excited too. Because for all the hand-wringing about the lack of bullpen moves over the winter, May possesses a superior arsenal to many of the high-priced arms that were available on the market. 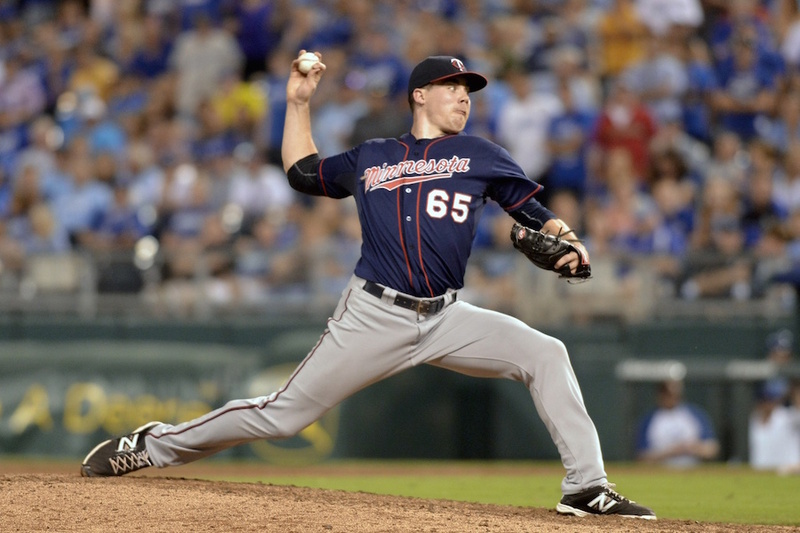 He might be the most potent right-handed reliever to wear a Twins uniform since Joe Nathan. As you can see from his 2015 velocity chart (via Brooks Baseball), May’s pitches revved up across the board after he moved to the bullpen in July. His K/9 rate increased from 8.0 before July 1st to 10.0 afterward. Flashes of his dominance have been on display this spring. His fastball has lit up the radar gun, clocking within a few ticks of triple digits, and his offspeeds have garnered plenty of awkward swings. In 8 2/3 innings of work, May has fanned 11 hitters, including three in his single frame on Wednesday. He has the makings of a bullpen ace, and one could argue that is an even more important asset than a reliable closer due to strategic usage. The Minnesota bullpen is invariably going to be a question mark going into the regular season, but without May it would be far more concerning. Only by blindly ignoring all of this team’s circumstances can one really question the decision. Another thing to keep in mind is that it’s not necessarily a permanent switch. Ryan has stated that he still views May as a future starter, and that’s definitely where the 26-year-old righty wants to end up. There’s little reason to think he can’t. But for now, he’s dutifully embracing this current challenge. Now there's a breath of fresh air. Just as his swing-and-miss pitches will be in the late innings. In case you hadn’t heard, Trevor May has a fun little side hobby. He creates house music, and recently partnered with the Twins Community Fund in an effort to raise funds for their various worthy causes involving baseball and local youth. His latest track, Balvenie (he says he named it after his favorite scotch), is available for download at his Bandcamp page on a “name-your-own-donation” basis, with 100 percent of proceeds going to the community fund. I recommend chipping in a few bucks and checking it out. The temporary move bit is nonsense. Santana, Hughes and Gibson aren't going anywhere for the next three years. Berrios and Duffey coming up. Stewart, Thorpe, Jay. And this doesn't include any acquisitions. Where does a spot open up for him? In the last year of their contracts Santana and Hughes become tradeable assets if the team is not contending. Depending on the situations and what is available, a team "going for ir" might consider taking on a longer contract as they might not go bust as badly as Oakland did. Terry Ryan is quick to point out that his team's last-place ranking is “a little deceiving” since they received only partial seasons from May and Kevin Jepsen, and Glen Perkins was not himself after the All-Star break.>>>>> Did Ryan say who was injured all the other years the Twins were ranked that low? It must have been an unfortunate set of circumstances for it to be an annual event? The May situation is inevitable and unfortunate.the inevitable is that he is the logical talent to slot into the pen. But it's logical because of the unfortunate. That being that the Twins won't eat had contracts, meaning the SP roster is stuffed, won't bring up young SO type pitchers, and weren't honest with him last winter, that barring an injury or uninitiated trade, he was BP bound. A FO blows smoke all the time, but this one was transparent and ham handed! "General manager Terry Ryan is quick to point out that his team's last-place ranking is “a little deceiving” since they received only partial seasons from May and Kevin Jepsen, and Glen Perkins was not himself after the All-Star break." Ahh, pointing out Perkins terrible 2nd half, but failing to mention the 28 innings they did get from Jepsen were farrrr better than can be expected of him this season. Why would Ryan say anything about the previous years when he was, I assume, asked about the lack of strikeouts last year? If the MiLB starting prospects continue to develop, May is in the right spot.Both as a reliever and future closer. 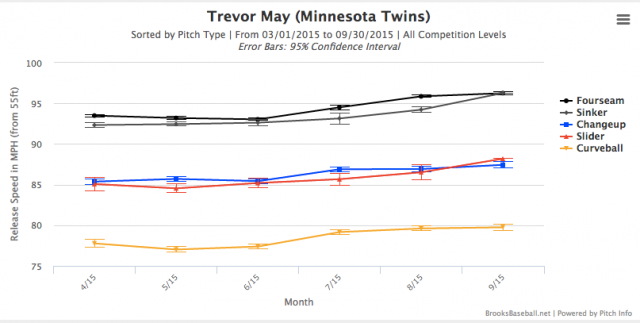 There is 0 correlation between "MiLB starter prospects" and "Trevor May's long term best spot". They could 5 high end prospects at AA knocking on the door, and Trevor May still holds more value as a good 200 inning starter than he does as a reliever. That value may be to another team, but it does not change the fact they are devaluing their own asset. Sounds to me like an awfully good problem to have! If May turns into a big asset at the back end of the bullpen, and they have enough quality depth in the rotation so as not to need him there... what the hell are we complaining about? Just a tick above his career average- 22.9% with the Twins, vs 22.3% for his career. Its too bad Molly didn't have the stones to put Pelfrey in the pen last season, especially with the low expectations for that 2015 teamm, so we would know for sure one way or the other what May's best role is. Do you think an ERA of 1.61 and an ERA+ of 261 is a reasonable expectation this year? You realize that the question he was answering was very specifically about strikeouts, right? I was talking K/9 rate but either way Ryan's point was fair. Unless those other guys are "good" whereas May could be great.......not saying that is the case, but I think that was the point. Ryan's point was it wasn't that bad a bullpen, because of a bunch things that were negative, w/o acknowledging that some things actually were better.....I think that is the point some people are making, right? That seems pretty obvious to me. Yes, I did not notice he was talking K's specifically, my fault. Could be great. Could be just a decent mid-rotation starter with efficiency issues, as opposed to a top-tier power arm in the bullpen. I'm not sure why everyone is so fixated on the one possibility. It's not like he was an elite starting pitching prospect. TR's point was that their last-place ranking in strikeouts is deceiving as it relates to the current group because their best power arms in the bullpen were absent or ineffective for half the season. The "point" people are making has nothing to do with what he said. To be fair, if we're simply talking about K's as you said, I'm not sure why Perkins is part of the conversation. His K rate was higher in August, September, October during his struggles. Yeah, if the rotation is stocked with "quality depth." But I'm pretty sure Hughes and Santana will be there whether they are good or not that good. Nolasco seems to still be in the pole position for another spot. Gibson and Milone probably don't need to improve to keep their spots either. That's the kind of rotation that you hope repeats 2015 but probably won't improve on it. Could be worse, of course, but it doesn't exactly absolve the handling of May. I do agree that having a guy in the bullpen that knows he has 2 good pitches, and will use those to get strikes, is a good plan. Like Duffey maybe. Luckily the Twins noticed this problem 3 years ago and drafted guys that can strike people out. We should start seeing them this year and I'm excited to see it. Not that they couldn't of signed one more during the offseason, but it's not the end of the world. I'm a lot more worried about the future rotation. So we take the one guy in our rotation that can miss bats, ayoung, talented pitcher and move him to the pen. Then we strip away two of his four pitches.And that is somehow a good thing? If we needed k's in the pen we had other alternatives.Steve Cishek signed for 2-10, 7.8 k per 9 last year, 9.5 for his career. I would be surprised if he gets another start with the Twins, especially if he assumes the same 7th or 8th inning role. May after 25 starts is a 4, and probably our 6th or 7th best starter at this point in time. Sano is 20-25 errors waiting to happen at 3B. so, they should just give up after 25 starts, and not help someone build for the future? I'm not sure I understand your argument.